Mount Temple NS team, Kacey Mulivihill, Aine Broderick, Captain, Ella Conlon and Eunice David deliberating the debate against the motion ‘Primary school students should be allowed to bring their mobile phone to schools’. 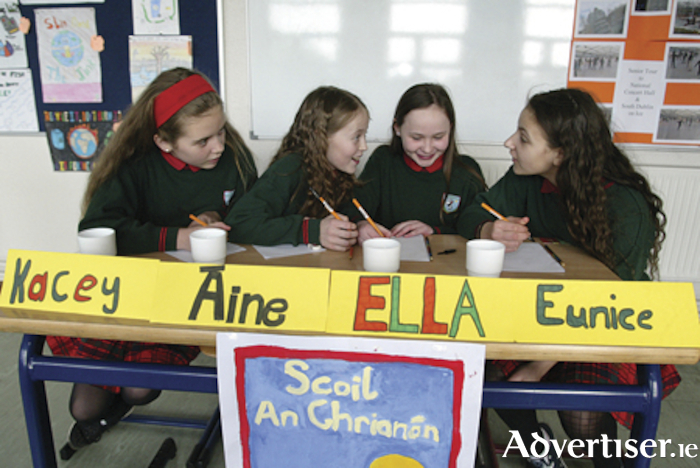 The dulcet tones of primary school children from Mount Temple NS and Coosan NS were clearly audible during the first round of the National Schools Debating competition which took place on Friday afternoon. Vying for victory and a place in the second round of the competition, both teams presented their arguments in a concise and highly researched manner with Mount Temple advancing by a narrow margin. They now face the challenge which will be presented by St. Oliver Plunkett NS Moate in the second round. Competion organiser, Cllr. O’Rourke, who chaired the opening debate expressed his delight that ten national schools were participating in this year’s event. “From now until May 10 I will be running around from school to school chairing the debates and encouraging young people to participate in public speaking when ever the opportunity arises. Self confidence, the ability to make a point, ask a question and engage with people are crucial life skills that will stand to these children through their lives and careers. “ A big thanks to the schools in the Athlone district. The primary school principals and teachers are incredible people, for me they are the heroes of our education system. Taking our children in as four year olds and preparing them for secondary school is a huge job requiring a great deal of compassion, skill and commitment. We are extremely lucky to have such wonderful people teaching and caring for our children,” Cllr. O’Rourke enthused.